A common foot problem that effects several people is dry feet, which leads to cracking occurring on the heels and other parts of the foot. Dry, cracked heels are not only unsightly, but they can also be a source of pain and embarrassment. Like the palms of our hands, the bottom of our feet have no oil glands which forces the feet to rely on sweat glands for hydration and keep moisturized. 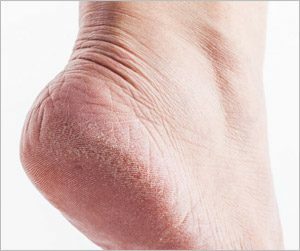 When dry, cracked heels are combined with other medical conditions like diabetes or athlete’s foot, the pain can be very extreme. Weather Extremes – Humidity levels are low during cold weather and High during warm levels. This can worsen moisture problems in the feet and cause symptoms to deteriorate. Aging – Our skin loses its ability to hold moisture as we age. This increases the chances of dry feet and the need to take extra measures to prevent issues as we age. Environmental Factors – Where and how often you walk and work, the shoes you wear, and genetics all play a role in dry feet. If you are experiencing dry skin on your feet or cracking heels, there are a few daily steps that you can take to ensure that your feet retain moisture and help reduce the symptoms. Treating dry feet starts by treating the underlying conditions that are causing it in the first place; lack of moisture and fungus. Using an anti-fungal foot serum daily is the most effective way to treat both types of dry skin. Since it is basically impossible to tell the difference between Simple and Fungal dry skin, using an anti-fungal serum that treats both causes ensures that you will get rid of dry skin for good. Do not file your feet! Filing creates micro-tears in the skin which ultimately makes the dryness worse. Much like caring for your car or your home, a little routine maintenance goes a long way. Apply a serum to your feet daily, especially after showering and before putting on your socks and shoes. This one little step is going to allow you to throw away all of those foot lotions, socks and files you have accumulated over the years. Keeping your heels healthy and moisturized will help you stay comfortable and active. Your body will thank you!